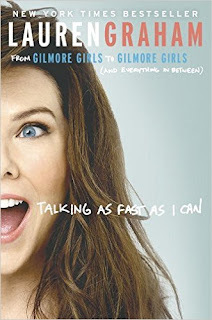 Between doing laundry and school pickup, I had the pleasure of listening to the audiobook version of Talking As Fast as I Can by Lauren Graham (read by the author). As a huge Gilmore Girls fan, I have been anxiously waiting for my turn on the library’s hold list to get my turn to hear her story. It did not disappoint. Graham spends some time discussing her childhood and her education, though I wish she had told us more as it sounded quite unusual. For instance, she lived with her father on a houseboat and could read fluently by the time she entered kindergarten. Then, she moves on to discuss her career journey. Again, she is so entertaining, I wish I could have heard even more of her personal stories about the ins and outs of the business. The highlight of the book for me had to be the amount of time she spent discussing Gilmore Girls (the original and the Netflix reboot). A large portion of the book is dedicated to discussing what her time on the show was like, her friendships with the other Gilmore actors and her feelings about the show in general. As I listened, I could tell she loved the show and was overjoyed with an opportunity to finish the show correctly. (The original series ended abruptly without the actors or crew knowing it was the end.) The last section of the book is actually Graham’s diary from filming the new reboot. It was a fun way to hear her read the diary entries with her usual mix of upbeat humor and honest reflection. Between her shocked admission to the show’s FINAL FOUR WORDS and her tears at the finale, I was enthralled. I just love her. I loved her on Gilmore Girls and Parenthood. I loved her fiction novel. I loved this memoir. If you are a fan of Graham’s or the Gilmore’s, give it a read (or a listen). You can purchase the book on amazon if you don't want to wait for the hold lists at your library. This is an affiliate link. Thank you for supporting my blog!